Dallas Detroit 2013: When pondering end-of-game strategy, coaches should remember that their opponents are totally irrational. When pondering end-of-game strategy, coaches should remember that their opponents are totally irrational. 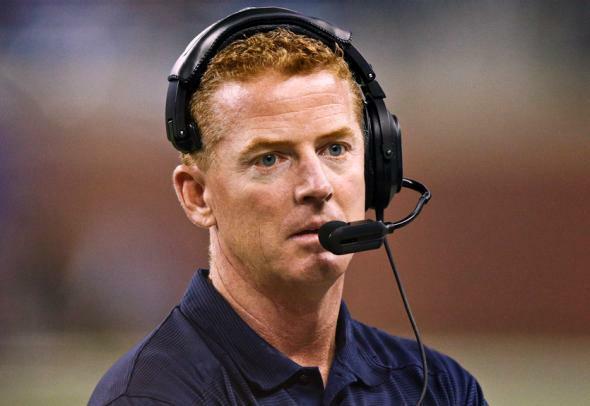 Could Cowboys coach Jason Garrett have done more to prevent a Lions 31-30 comeback? When Detroit failed to convert a fourth-and-12 from its own 31 late in the fourth quarter, all seemed lost for the Lions. Dallas was up by 3, and the Cowboys now had four downs to burn clock. According to the Advanced NFL Stats time calculator, with 1:24 to play and Detroit having two timeouts, the Lions could get the ball back at best with only 21 seconds remaining. Dallas (smartly) ran the ball on first and second down for small losses, forcing Detroit to use its timeouts. On third down, Dallas ran again, this time gaining 9 yards. But Cowboys tackle Tyron Smith was called for holding, stopping the clock and saving Detroit 40 seconds. Smith’s penalty would ultimately prove fatal, as taking the game clock down to 21 seconds would have virtually sealed the win for Dallas. Instead, Detroit had enough time to embark on an amazing last-ditch drive, snaring the victory on a sneak by quarterback Matthew Stafford. As strange as it might sound, Dallas’ best option may have been to punt. Yes, to punt from the Detroit 26-yard line. Hear me out. A punt from that deep in enemy territory would almost certainly pin Detroit near its own 10. Forcing an offense to go those 10 extra yards has historically made a big difference in the chance of scoring a last-second field goal. Indeed, it cuts the chances of Detroit scoring nearly in half, from around 40 percent to 20 percent. But there’s an extra wrinkle. Strangely, Dallas would have preferred to keep Detroit within 3 points rather than extend its lead to 6. When desperate teams like the Lions with no timeouts remaining get into the outer rim of field goal range, they send in the field goal unit for a long-range attempt. This is an irrational decision, one I discovered the very first time I began looking at win probability numbers. Rather than try to win the game, teams in this situation settle for a tie—or rather, an attempted tie. Even if the field goal attempt is good, it only buys a 50–50 shot at the win in overtime. My win probability calculator puts the field goal option at a total of 0.87 WP—that means the decision to kick nets the Cowboys a win 87 percent of the time. The go-for-it option gives Dallas a 0.93 WP, and the punt option is best of all (albeit barely) at 0.94 WP. These win probability numbers are baseline estimates, and should not be considered definitive. But they do support the notion that pinning the Lions deep in their own territory may have been the preferred option for Dallas. Am I claiming that Jason Garrett is dumb for not punting the ball up by 3 points from the opponent’s 26-yard line? Definitely not. It would have been too far out on a limb, even for me. But it does illustrate that when your opponent acts irrationally, sometimes the rational decision doesn’t end up looking so smart.